I am wildly infatuated with this time of year and I'm sure I'm not the only one! Spring and summer months are simply the best; gone are the days of huddling inside during the cold, dark winter. Now we can burst back outside and have so much fun! One of my favorite things to do during this time of year is biking. It's just so liberating to trade four wheels for two! It's not only great exercise, but for me and my girls, it's relaxing and joyful. Physical activity is wonderful for kids and adults in countless ways, and it sure beats stayed cooped up indoors. 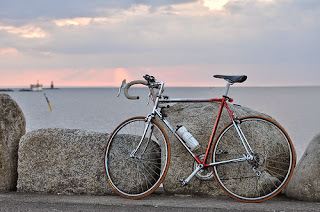 The delights of riding a bike extend beyond just fabulous exercise - it's the perfect way to go green, and by biking more and driving less, you're helping the environment, and the environment is important. You'll save on gas: In case you haven't noticed, gas prices are high - painfully high. By traveling on two wheels instead of four wheels more frequently, you'll save a hearty chunk of money. Nobody likes being shackled to the pump, anyway! Help the environment: By cutting gas usage you're also doing your part to help the environment. Did you know that 33% of CO2 emissions in America come from transportation, with a lot of that coming from cars? As a cyclist, not only will you enjoy more fresh air, you'll preserve more clean air! Burn those calories: This one goes without saying. Physical activity is important. It packs a powerful punch for your physical and mental health. It eases anxiety, battles depression and boosts confidence! It is a mind-body revolution that is fun and so worthwhile! Plus, children develop their own habits by witnessing yours, so this is a fantastic way to foster loving dedication to health and sustainability in them. Appreciate your surroundings: It's difficult to stop and smell the roses when you're zooming by in a closed container on four wheels. With your eyes on the road (and never on your phone, of course! ), the lovely birds and lush greenery pass you by in brief blips. On the bike, you can truly savor your surroundings. If you're on a leisurely ride with the kids, you can stop as you please and enjoy their company and this wonderful earth. You can teach them about birds and plants. Even if you're on a mission to get somewhere, the fresh air and lively nature sounds will invigorate you. Set a good example for your children: It's no secret that it's the digital age, and electronics are often what children crave, whether it's in the form of video games, cell phones, tablets or computers. However, it's important for your children to understand that there's nothing like playing outside and staying active. Outdoor play offers an endless bounty of benefits for kids; it grows imagination, hones decision-making skills, strengthens bodies, boosts confidence and so much more. Fresh air is good for you: Often, inside of homes and offices, the air is recycled. This process is imperfect, however, so dust and contaminants do accumulate. Biking is a glorious way to purge out the old, stale air and fill up with fresh air. Spring cleaning should definitely go beyond just the inside of our homes! You'll enhance family teamwork: I love the sense of camaraderie that comes with family biking trips. A lot of non-verbal communication is needed for safety. My family has developed a fun, quirky array of hand symbols we use to chat while biking. They make us laugh, feel secure and feel closer! We also like to cycle through leader positions; the lead biker gets to choose where to go! This gives kids a healthy dose of leadership skills and is often the start to some zany adventures! Do you ever go out for a bike ride? When the weather is an absolute dream, it's a shame to miss out on it while driving. I know it's not always possible to trade four wheels for two, but I urge you to go for it whenever you can.